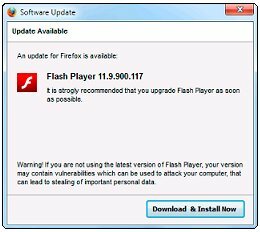 The latest in computer scams involves a harmless piece of software that you probably already have on your computer… the Adobe Flash Player. The most recent vulnerability is referred to as a drive-by-attack, or drive-by-download. You don’t have to click on anything or download anything on purpose. You simply visit the infected page, and the flash applet loads automatically without ever asking for permission (like most flash applets do). The difference is that this one carries a malicious payload. Once the applet is loaded, you are infected. There is simple fix for this, and that is to keep your Adobe Flash player up to date. So when you get a notification that states an update is available for Adobe Flash Player, be sure to grab it.